The Government has commissioned a detailed review of driving laws to clear the way for the introduction of self-driving vehicles. Roads minister Jesse Norman has announced the start a three-year review by the Law Commission of England and Wales and the Scottish Law Commission, which will ‘examine any legal obstacles to the widespread introduction of self-driving vehicles and highlight the need for regulatory reforms’. Department for Transport officials said the review will be crucial in examining how current driving laws can support the next generation of vehicles. Officials said that key aspects will be adjusting laws to reflect the fact self-driving vehicles will not have a driver in the traditional sense or a steering wheel and also consider some of the criminal offences involved. The project’s end date – 2021 – is the year that ministers have said they expect to see driverless cars widely in use on British roads, although experts have doubted whether the regulatory framework will be in place in time. Mr Norman said: ‘The UK is a world leader for self-driving vehicle research and development, and this work marks an important milestone in our continued commitment to the technology. Mr Norman announced the review during a visit to the GATEway project in Greenwich, which is being led by TRL. The GATEway project has worked on a number of trials and demonstrations, including an autonomous delivery pod with Ocado and an automated valet parking trial. 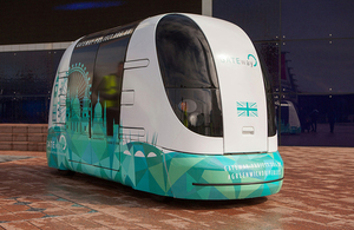 The project is now entering its final phase, which will see a fleet of automated pods providing a shuttle service (pictured) around the Greenwich Peninsula to understand public acceptance of, and attitudes towards, self-driving vehicles. TRL CEO Rob Wallis said: ‘Regulation, safety standards and vehicle insurance models all have a key part to play in enabling change, whilst giving society confidence that these new products and services can be introduced safely.